The anticipated, the dreaded, the devastating final book of Discworld. I know a lot of people who haven’t been able – for various reasons – to read this yet, so I’ll keep it spoiler free. Whether Pratchett wrote this book knowing it would be his last or not, I don’t know. But I can see him tying up a lot of loose ends, as well as opening new doors – which will now lead to the forever unknown as his daughter has announced the series will not continue. 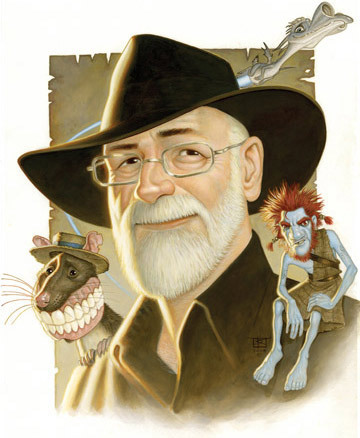 When Pratchett passed away this year and it was revealed that he’d left behind a manuscript for another Tiffany Aching book, I felt immensely comforted, because she was one of the characters who got me hooked on Discworld in the first place and her storyline will always have a special place in my heart and on my bookshelf. However, when the book arrived, it turned out that the end was bittersweet. While I don’t agree with the direction Pratchett decided to take with the characters in The Shepherd’s Crown, I can also see that it was necessary and how the circle has been closed. But that doesn’t mean I will ever get over it. And neither will I get over the fact that this most gifted of storytellers is no longer among us, because he clearly had so many stories left to tell. This book came through as a free review copy from NetGalley at a moment when I needed something light and sweet, and for that kind of mood it is spot-on. It reminded me a lot of Mark Haddon’s Curious Incident of the Dog in the Night-Time, in that it’s mainly told from the perspective of a little boy who tackles the big problems of a grow-up world. Milo is an absolutely adorable little boy who wont’ let his difficult family life and debilitating eye condition prevent him from uncovering a misuse scandal in the local retirement home while helping a Syrian refugee and sorting out his mother’s love life. It’s one of those innocent, feel-good stories for a Sunday afernoon when the world just needs to be put right. The world has lost a very particular something today. If you look closely, you can see that a fine coating of sparkles is no longer there. It was swept away by the departure of a man who has added a little bit of magic to a lot of people’s lives. 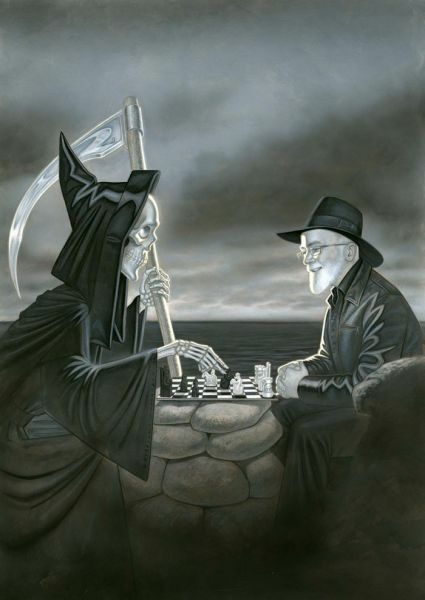 Sir Terry Pratchett has left us. The news spread today like a shockwave, certainly in my social circle, which is filled with people who love him and have grown up with his books. The first reaction, from most people I spoke to, was simply: No. NO. It cannot be. After spending years, if not decades, in the company of his books, travelling his worlds and meeting his characters, nobody seems to be able to imagine a world without him yet. Texts, emails, Facebook messages started flooding in and out. Have you heard. Very sad news. Noooooo! I can’t even… And each message, each person adding their voice to this gathering wave of mourning, brought more tears. Meanwhile the people who aren’t familiar with the Pratchett phenomenon looked at me somewhat blankly, feeling visibly awkward about the fact that I was crying in the office about the death of an author as if I’d lost a friend or family member. Because it is more than the death of a hugely loved author. It is the loss of a man who has given me worlds, universes, a whole different layer of reality where I have spent hours, weeks, probably moths of my life and where I’ve met creatures and characters who have become so real that I have long ago accepted, as a personal truth, that they really do exist. They are real because Terry Pratchett, with his incredible imagination and his unmatched gift of language, has not just created them but brought them to life. Discworld, for me, is a place. It’s somewhere I can go anytime and hang out with old friends – Granny Weatherwax and the witches, Rincewind and the wizards, Sam Vimes and the City Watch, the dwarfs, the trolls, the lot of them – and after 40 books spent in their company, they really are old friends to me. Going into Discworld is as real as going on a holiday – flying out to Sardinia or to Spain, where we tend to go in the summer. True, it doesn’t involve quite so much packing and travelling (and it’s certainly improved by the absence of the Ryanair Factor), but it really is the same thing. Discworld is a real place for me; it exists without a doubt. And that’s why Terry Pratchett means more to me than a favourite author. Great authors give us wonderful books that we read, and return to, and that we take things from and treasure forever. But never in my life have I come across any other author who has given me a whole world. So far, with him still being active and writing several books a year despite the grip of Alzheimer’s tightening on him, this world has been endless. No matter how many books I read, I thought, there will always be more. 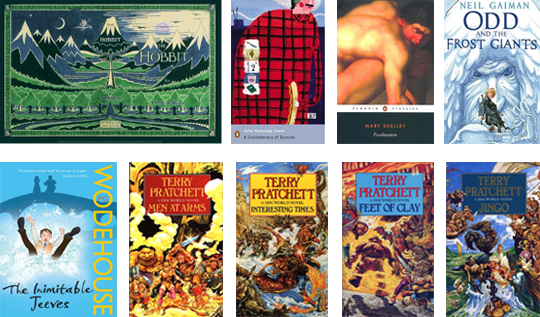 After all, I still have quite a few of his non-Discworld works to get through. But now his death has put a border around this endless world – or maybe a rim that you might fall off if you venture to the very edge. And that breaks my heart, because now there will be an end to reading his books. 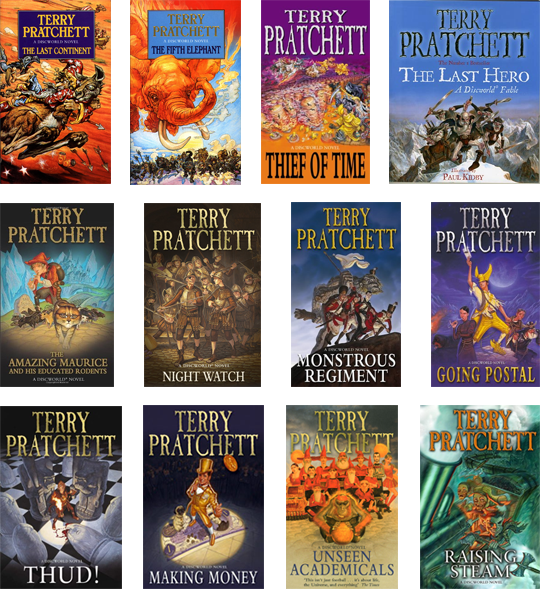 Even if I take it slowly, each remaining unread book now a treasure, I will arrive at the last book written by Terry Pratchett. The sand is slipping fast through that particular hourglass on Death’s shelves. I will miss his wisdom, his wit, his imagination and most of all his incredible understanding of what makes us human. His books are largely categorised as fantasy, but I’ve always found that they are first and foremost about humanity. Terry Pratchett wrote about human nature with the insight of a philosopher, the warmth of a father and the wit of an Englishman. I have always considered him one of the great philosophers of our time, a hero whose superpower was to see right into the soul of human beings. 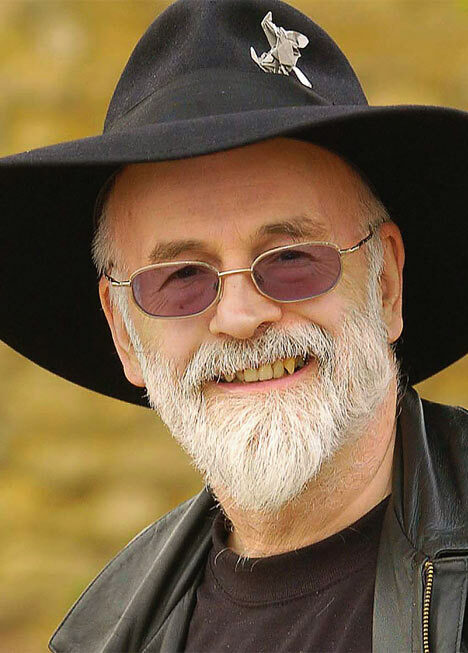 I’m unbelievably sad for this amazing human being we have lost today, and so, so grateful for all the magic Terry Pratchett has given to so many people around the world. And I’m grateful that he was allowed to go to sleep surrounded by his family, with his cat snoozing on the bed (probably positioned to cause the greatest possible discomfort to everyone, as good cats do), escaping from Alzheimer’s before it had a chance to destroy his wonderful mind. Farewell, Sir Terry. Thank you forever for giving me a world. I hope your onward journey is safe and joyful, and involves at least one pint with Death in the pub at the end of the black desert under the endless night. Just to tie up the loose ends, here’s the last of the 2014 Bookshelf – books new and old by some of my favourite authors. 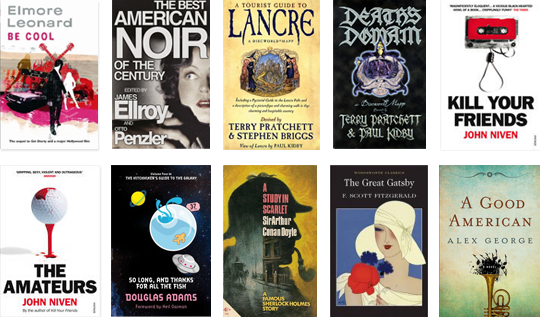 While some of these guys never fail to impress (Ellroy, Pratchett, I’m looking at you!) others didn’t exactly blow me away this year. I’m currently reading Ruth Ozeki’s All Over Creation but this will be one for next year’s shelf. Which means my Goodreads challenge closes at 106% or 55 of 52 books. It’s almost March and I still haven’t reviewed all of last year’s reads. But here, finally, is the last batch. I’ve been lazy. So, with a massive delay, here’s the first bunch of the Bookshelf from the second half of 2012! The usual health and safety warning applies: May contain spoilers. Pratchett’s take on the music industry: Somebody finds a magical electric guitar and soon the Disc is turned upside down by Music With Rocks In It. It’s basically a condensed history of everything that happened in music since the first rock ‘n roll tune was born – rockstar tantrums, shady agents and crappy punk bands are just the start, and of course the traditionally Pratchett-esque digs at musical celebs and the industry they feed are spot-on as ever, and laugh-out-loud funny, too! Although Neverwhere had left me pretty disappointed, I decided to try another Gaiman, and I’m glad I did. Written for a young audience, the story of an orphaned toddler being adopted by a bunch of ghosts and raised in a graveyard is as morbid as it is touching. The Graveyard Book reminded me very much of the movie version of Coraline with its wacky characters and magical excursions into fantastically scary worlds. It’s the kind of book that is full of characters you’ll want to pluck off the page and add into your real life. It’s the kind of book I would have read over and over again as a girl, feeling the characters become more real every time, until I’d convinced myself that they actually do exist somewhere in a graveyard just beyond my reach. (I was a bit of a loner, as you’ve probably figured.) The Graveyard Book took me right back to my early reading days and reminded me why I’ve never been able to live without books. Oh-kay, weirdness alert. I wasn’t really sure about the whole Thursday Next series, but decided to give it a go after several friends recommended it. And I’m afraid it ends for me with volume one. Although the meta fiction thing grew on me about halfway through the book (when the actual plot finally kicks in after some over-indulgent introductory rambling), the concept behind it seemed just a bit too chaotic. Special detectives protecting our literary heritage? Cool. Real people and fictional characters jumping in and out of books? If we’re going that way, fair enough. A Nineteen Eighty-Four inspired setting? Well, if you must crush us with references, okay. It was when the time travelling came in that I got a bit of overload, and when it moved on to the vampires and werewolves, I finally had enough. It’s a shame that Fforde had to hopelessly over-clutter The Eyre Affair by cramming in every possible aspect of fantasy literature he could think of. Because the bit about moving between the real world and literary world would have been pretty awesome without all the rest annoying the hell out of you.